Is it because the Muppets don’t age? Because the writers know their characters so well? You wouldn’t think the Muppets have been off the air for 17 years after watching last night’s premiere of their new sitcom, The Muppets, on ABC. 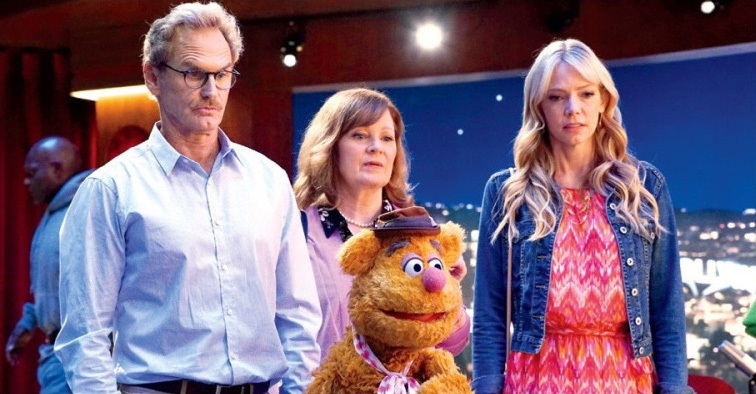 Sure, the format is fresh and new, but the core of the show–the rich characterizations of not only the main cast of Kermit, Miss Piggy, and Fozzie, but subordinate cast members like Electric Mayhem band members, too–is every bit the same as it was when the acting troupe first appeared nearly 40 years ago in 1976 on The Muppet Show. The Muppets are back, and as laugh-out-loud funny as ever. Credit great, punchy dialogue and situational humor appropriate for kids of all ages to the writing staff, who don’t let down fans of the original show or any of its brilliant movie incarnations. The only travesty of The Muppets? That the show is in a 30-minute time slot and only airs once each week. Sigh. This time the Muppets are seen as they are, behind the scenes in the “real world” of actors and production studio antics in Hollywood. 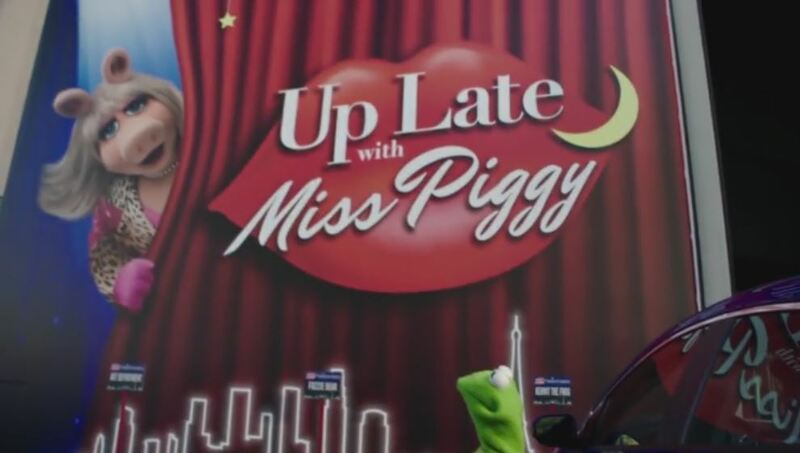 Kermit is still in charge of the show, but this time the show-in-a-show is not a variety show but in the late night format, with Miss Piggy as host. 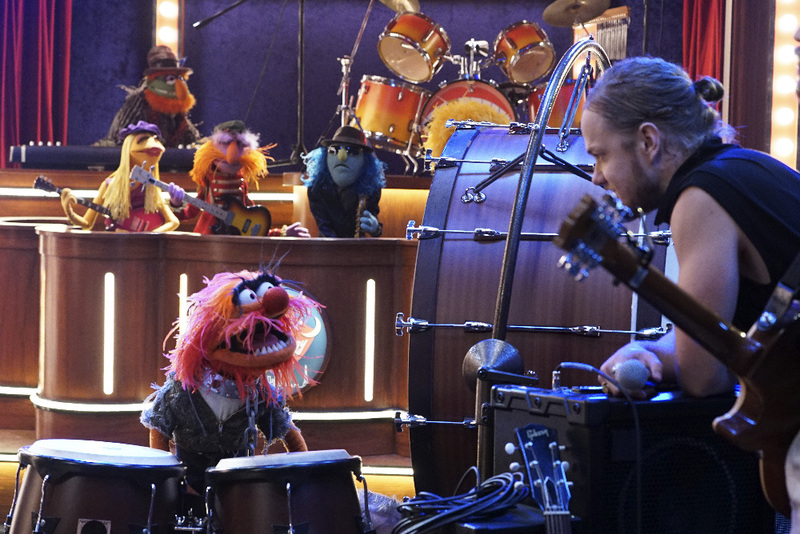 Dr. Teeth and the Electric Mayhem band sit in where you’d see The Roots on The Tonight Show, with Fozzy in Steve Higgins’ role. The first guest star is Elizabeth Banks, who gets taken for a ride by assistant showrunner Scooter, with a comical appearance by Dancing With the Stars’ host Tom Bergeron and musical guest Imagine Dragons (we featured their Muppet tie-in video years ago here at borg.com). The success of the humans in the show is judged as in the past–the ability to seamlessly interact with the Muppet cast, and both Banks and Bergeron have no problem blending right in. The show is peppered with one-liners and innuendo, exactly in the style as the original 1970s series. But in truth, the laughs are probably funnier–the kind of humor you might find in a Tina Fey show or The Office. You know you have good comedy when guitarist Janice makes a comically timed Imagine Dragons joke and Zoot gets cut off in the middle of an A.A. meeting reference. As humor goes, The Muppets is the real deal. Of interest to viewers eagerly awaiting the pilot, between the original trailer release we previewed earlier this year here at borg.com and last night’s pilot episode, some scenes were re-filmed, including a Gonzo joke about the show’s format, and Fozzie the Bear’s human girlfriend Becky mysteriously changed from a brunette (NCIS, Everwood, and House, M.D.’s Margo Harshman) to a blonde (New Girl, Supernatural, Buffy the Vampire Slayer, and House, M.D.’s Riki Lindhome). All the regulars are back: Kermit, Piggy, Fozzie, Gonzo, Rizzo, The Electric Mayhem, Scooter, Sweetums, Bunsen Honeydew and Beaker, Sam the Eagle, Statler and Waldorf–only Rowlf is noticeably missing from this round but slated for a later appearance. If you’re looking for something for the whole family, even with parody of adult dramas, which will–and should–go way over the heads of little ones, The Muppets is a real win. (And if you think the show is inappropriate for your kids, blame yourself, Parents). Set your DVRs now for The Muppets, Tuesday nights on ABC.